Our bespoke planter service is available with the vast majority of our contemporary outdoor planters. 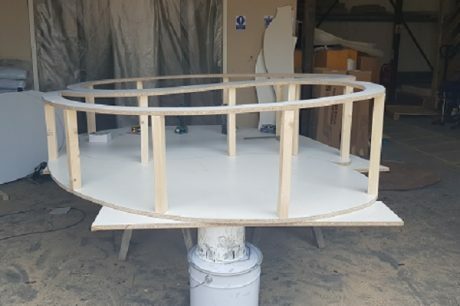 We have an excellent team of experienced, highly skilled & creative fabricators that can produce bespoke designs in a range of innovative materials. 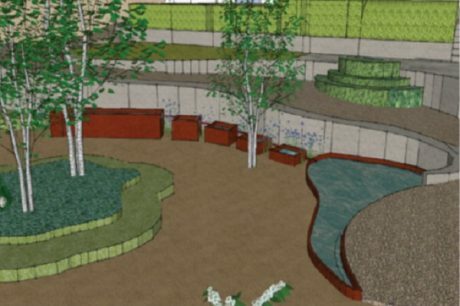 We can cater for sizeable commercial projects to deliver large contemporary planters and extra large plant pots, as well as custom sizes for smaller garden projects. 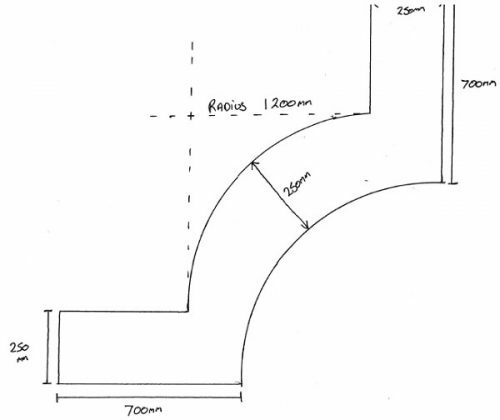 We can make adjustments to the contemporary designs and sizes that we have in stock or work from a detailed specification to meet your exact requirements. Below you will find examples of the bespoke projects we have worked on to give you a feel of what we can do. 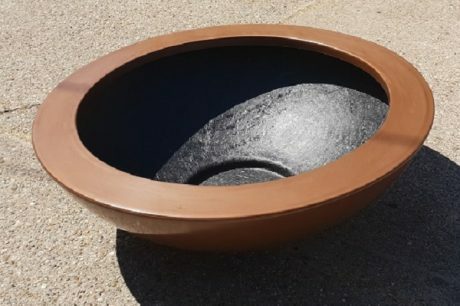 We are only bound by your imagination so if you require any advice or would like a free quote for a bespoke contemporary planter, contact our team today! Give us a call on 02476 559 416. Fibreglass is a very popular material choice for our customers as it offers fantastic benefits with real value for money. Our Fibreglass planters carry a full 5 year warranty along with frost and UV protection, ensuring a quality garden product that will stand the test of time. We have a range of Fibreglass Planters in many shapes and sizes that are in stock and ready to order, so take a look! We can also deliver bespoke fibreglass planters and street furniture in almost any shape, size and RAL colour. If you can think it, we can build it. 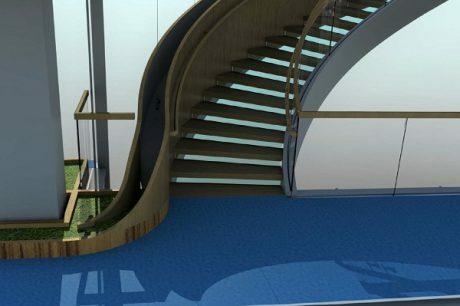 Get inspired by some of these examples of our customer projects made to spec using high quality Fibreglass. For this job, the client asked for a Ying Yang design planter whereby each half of the Ying Yang could be moved independently. This was a unique project that made use of the skills and creativity of our Fibreglass fabricators process, and we loved it! 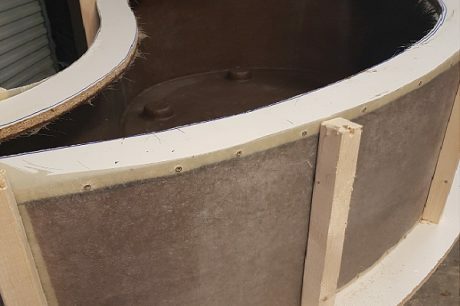 The made to measure planters were each constructed using quality Fibreglass and included seven recessed hidden swivel castors to allow each planter to be easily moved. The design included a sloping top from left to right and it was completed with an Oak Veneered finish. The same client came back to us after we installed the Ying Yang planters after being so impressed with the speedy response and our flexibility to meet their exact requirements. 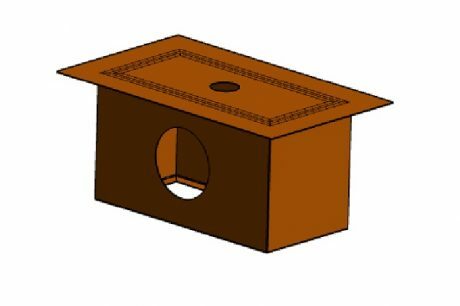 We’re now working on a similar design that will feature the same recessed hidden castors. The new planters will be clad with half log rolling by the client onsite. 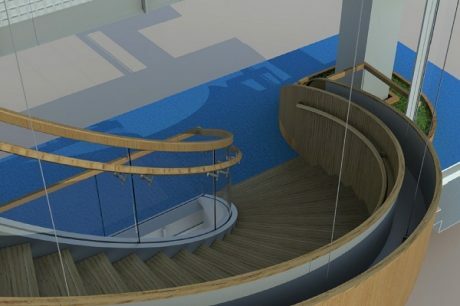 During another ongoing job for the Heron Tower in Central London, Taylor Made were requested to design a Fibreglass GRP liner so that the client could plant in a trough shape container that ran down the length of a staircase. We recommended that we came out onsite and actually line this though in situ as it was a more efficient and cost-effective solution. 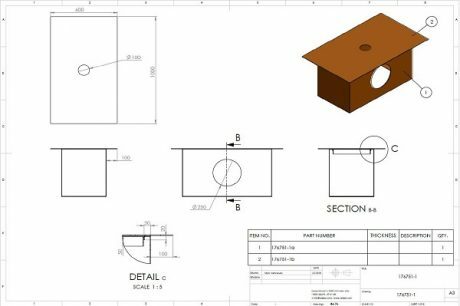 It meant that we could eradicate any problems that may have occurred from inaccuracies in the drawings and meant that we did not need to cost for a mould to be made. 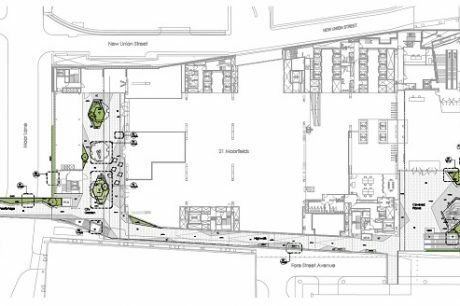 Instead we could use the site itself as the mould and achieve a seamless finish from top to bottom. As the client wants the planter trough to contain real plants and not artificial plants, we suggested adding riffles to the base of the planter (a design similar to those used by gold miners to trap water in sections) to ensure that the plants at the top of the planter could stay healthy and there was no water logging at the bottom. The client was very happy with this suggestion & we look forward to seeing this job completed. We provided the owner of a fantastic London restaurant with two of the Ceder Fibreglass Bowls with a specialist copper effect finish. The restaurant was furnished with some really quirky and contemporary furnishings with a copper theme throughout, including the lighting, bar and doors. The client wanted to continue with that theme outdoors and so we supplied him with custom planters to match the decor. The client was extremely happy with the end result. Aluminium is a great choice for customers looking for a low maintenance garden planter, with an exceptional life span. Our Aluminium planters come with a 5 year warranty and offer a timeless contemporary appearance that looks fantastic in any outdoor space. 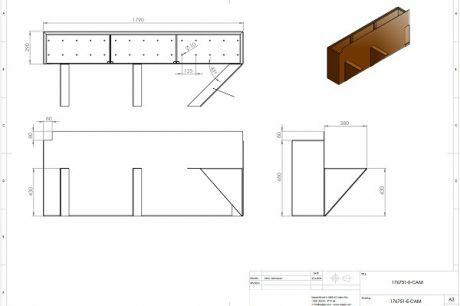 Our metal fabricators endeavour to provide the highest quality products whilst being fairly priced and built to the exact requirements of the customer. Aluminium has an excellent strength to weight ratio so they’re an ideal choice when the weight of the plant needs to be considered. 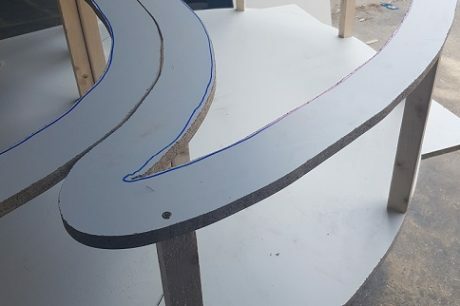 We can supply our metal designs with a tough scratch resistant coating, in almost all RAL colours and with a matt, semi-gloss or high-gloss finish. Find out more about our outdoor Aluminium range. 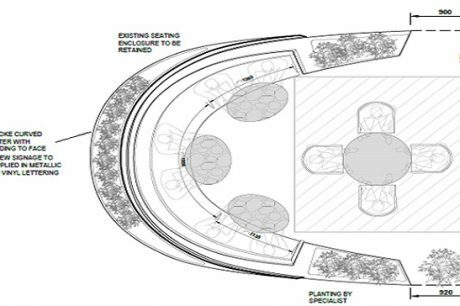 For this bespoke contemporary planter project, the client requires a large number of Aluminium planters incorporating seating for a new building development. The client has a wide range of designs for this landscape; here is just one of them. The custom made planters have a fantastic design with split levels and integrated seating at either end. They are ideal for enhancing the outdoor space on offer. This is another design the client provided us with wanting these planters built and delivered for the new build project in London. 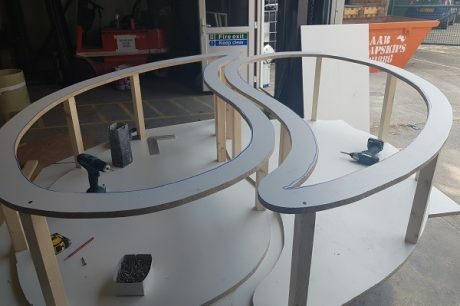 These bespoke planters are designed to cantilever over the expansion joints laid within the floor, offering practicality as well as great outdoor aesthetics hiding the joints. 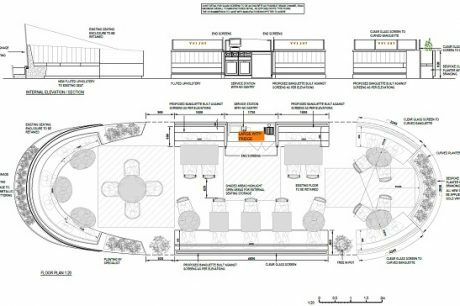 The containers are then required to have an integrated bench attached at the deepest edge furthering the practicality of these planters. 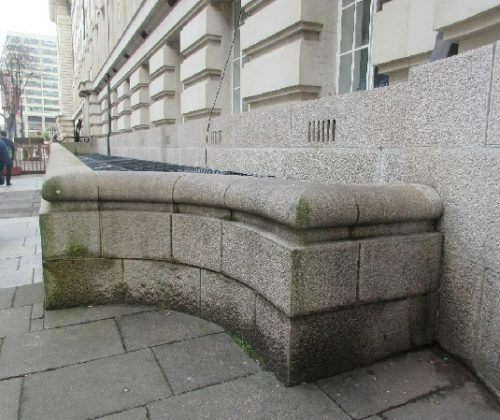 The brief requirements here were to have Aluminium planters run along the front wall of the County Hall Riverside building in Central London. 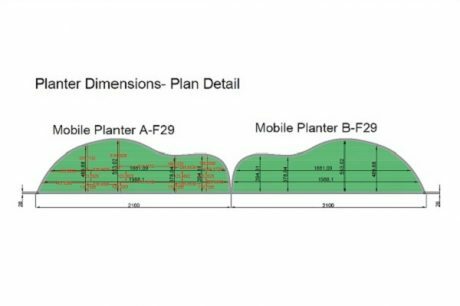 The length of this run is 120 Meters; which we can split into planter sections of three metres for ease of transportation and installation at the customer’s request. 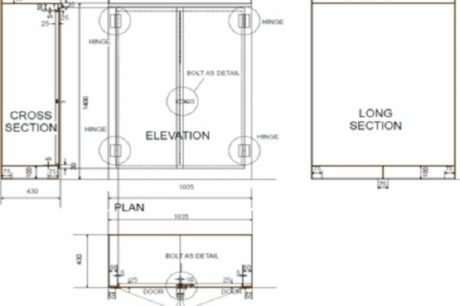 This is the design of the planters for the straight runs and features a slanted internal base with overflow water spigots along the back edge. This is to ensure that no runoff water would run down the face off the wall and that it would naturally drain to the back of the wall. The final product is to be powder coated in a bronze effect for a sophisticated finish. 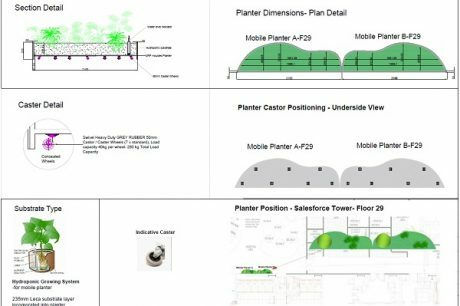 This is a plan view for the customised contemporary planters to follow the curves of the wall. These planters also feature the same slanted internal base and overflow water spigots for drainage as the planters above. 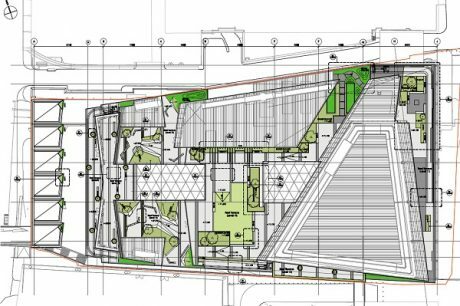 The design and installation is set to last for many years to come with a seamless finish along the entire length of the building with virtually no maintenance required. Corten Steel, also known as Weathering Steel, is very trendy currently and featured in many of the garden designs at the RHS Chelsea Flower Show 2018. Corten Steel was designed initially for industrial uses, such as buildings and bridges, as it does not need to go through any additional processes like being painted or dipped in hot zinc to protect it. Once it weathers outdoors, a surface layer of rust is formed which will then protect the Steel underneath from further corrosion. This makes it a highly cost effective contemporary material for producing garden planters and other applications. 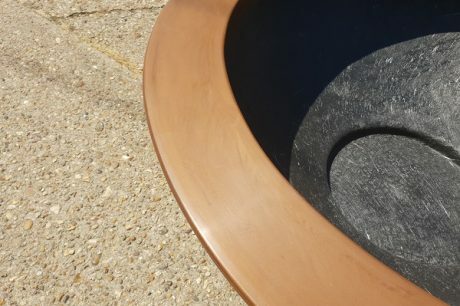 Taylor Made Planters can provide bespoke Corten Steel planters and street furniture in almost all shapes and sizes. See some of the jobs we have worked on in this material below. After completing an 18 month roof terrace project, one of our customers was in need of some bespoke Corten Steel planters and furniture. He had been to numerous other companies in the search for these products and couldn’t find anyone capable or willing to take on the job. Unfortunately he had also received some bad service elsewhere. Taylor Made were really pleased to help on this project where we provided all the bespoke products he required. We worked really well together, and our experts suggested some changes to the already fantastic designs he had in mind. 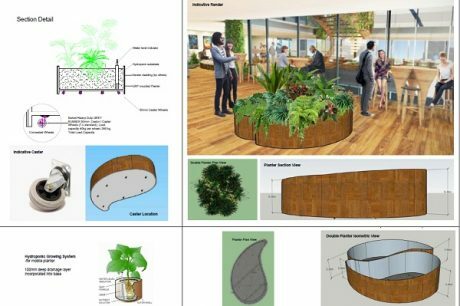 The final designs included classic planters, a Corten Steel table, floating benches attached to planters, a storage locker and a bench planter with a Corten back plate with extra outdoor storage attached. This client requires some Corten Steel planters to be used as a water feature. He was over the moon when we informed him we actually supply Corten Steel water features and can produce these in custom shapes and sizes. 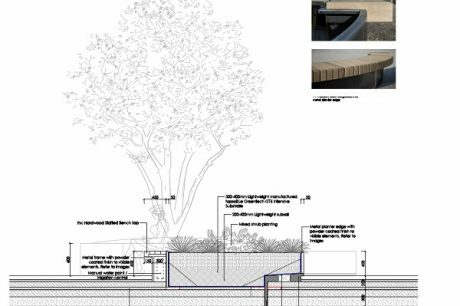 This job consists of a range of Corten Steel troughs that get lower in height, with little Corten channels between them so the water flows from one trough to another. 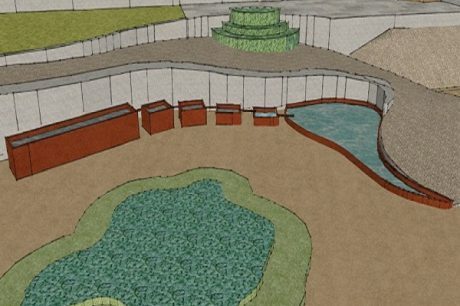 To finish this water feature off, we suggested using Corten Steel edging to form the shaped pond and to tightly snug round the wall it sits in front of. A great design and a great job. This customer required a planter from our Corten Steel Andes range, but to include one face off square to match the angle of her fencing in her garden. With the angled face of the planter to go against her fence it meant that the planter would still remain square to her house and gave a much better aesthetic appearance. 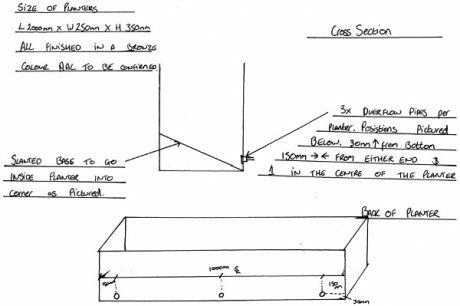 This order was not big or complex, just a small tweak that made a huge difference to the design of a customer’s garden. Galvanised Steel has always been a favourite choice for commercial and industrial projects, particularly as the industrial design style is increasing in popularity within the public market. Galvanised Steel is an everyday mild Steel that is dipped into hot molten Zinc to provide a highly corrosion resistant coating. This produces an extremely long-lasting material with an ultra-modern and contemporary appearance. 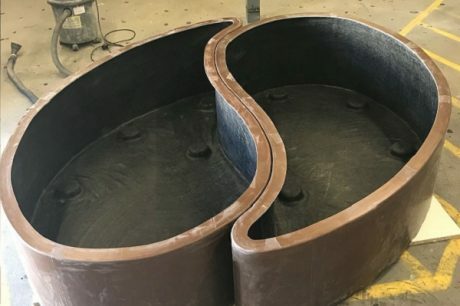 The manufacturing process makes it very strong so it is perfect for building outdoor planters and furniture where a robust and industrial theme is required. 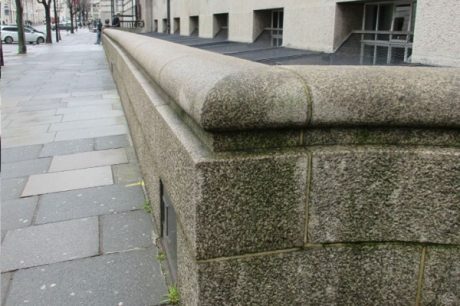 Due to the weight of this material, Galvanised Steel is not recommended for use on roof terraces. 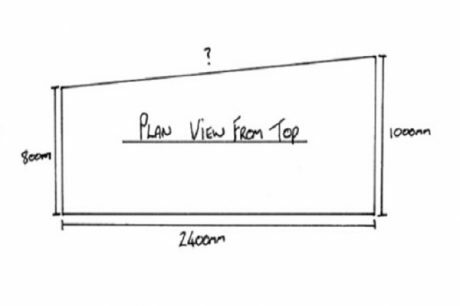 A large patio planter could weigh 40kg in Aluminium but could be up to 130kg in Steel. The client required a number of Steel Metal Planters for the popular restaurant in Leeds. 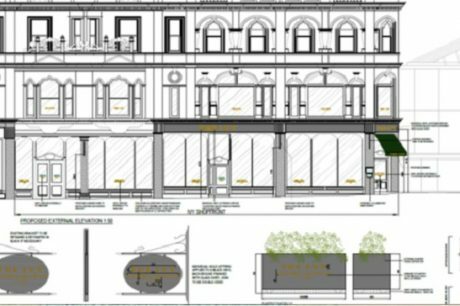 The Ivy is a new restaurant that is being fully refurbished before its opening. A modern and contemporary theme is required and Galvanised Steel is the perfect fit for the brief. One of the designs includes a trough shaped planter in a custom size that includes recessed hidden castors for ease of movement. These are three other designs the client requires for the The Ivy. One is a long sweeping curved planter made from Steel with the Ivy branding on the outer face. 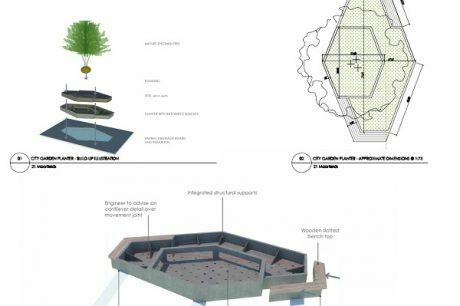 Another design was for two bespoke shapes to fit either end of the curve, and to complete the project, round Galvanised pots to house small trees. 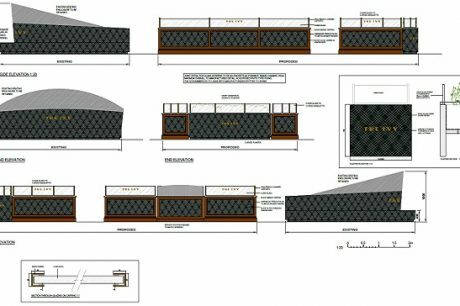 It is a very well thought out design overall and we’re looking forward to booking a table at The Ivy to see them all in place once finished. We provided 9 Galvanised Steel planters for a residential garden made to an exact brief so that they would fit nicely into an existing area. 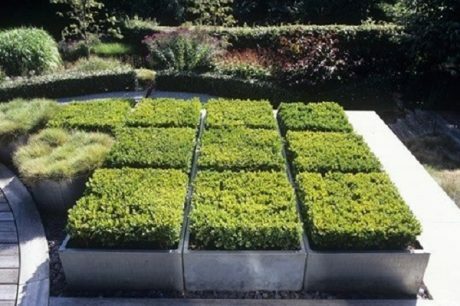 The customer wanted the planters to create a modern grid pattern and we think it turned out great. We initially had other suggestions about the design, but they say the customer is always right for a reason – we love it! Our bespoke service helped this customer make the very best use of their outdoor space.